A Change Of Pace For Detroit's Anna Burch : World Cafe Hear a performance of songs from the singer-songwriter's debut Quit The Curse recorded live for WXPN's Indie Rock Hit Parade. Anna Burch performs inside the World Cafe Performance Studio in Philadelphia, Penn. for Indie Rock Hit Parade . Detroit based singer-songwriter and guitarist Anna Burch recently released Quit The Curse, her debut solo album. Burch, a longtime member of the folk-rock band Frontier Ruckus, has a musical change of pace and exudes a confident and breezy appreciation for indie-rock on the debut, written when she first moved to Detroit after finishing graduate school in Chicago. 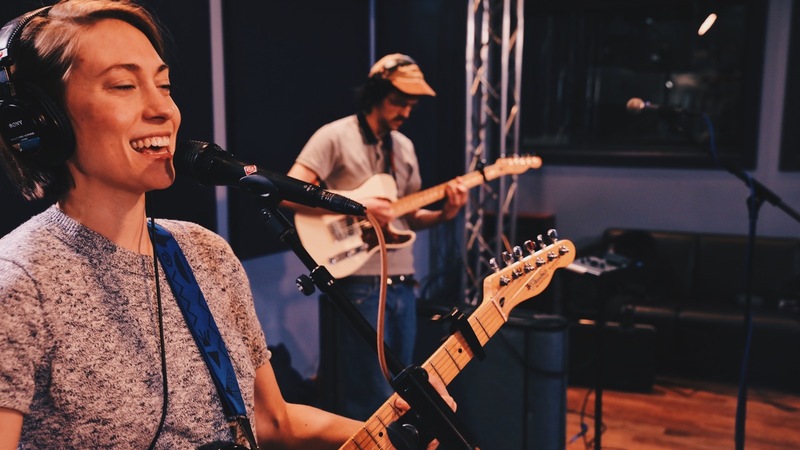 Burch and her band mates recently recorded a four song set in the World Cafe Performance Studio for WXPN's Indie Rock Hit Parade, hosted and produced by Eric Schuman. First up is "2 Cool 2 Care," which also serves as the album's opener. A showcase for Burch's smooth and breezy vocals, the song incorporates some lyrics and harmonies from Tommy James & The Shondells' 1968 hit "Crimson and Clover." Next up is "Asking 4 A Friend," which Anna describes as being about a relationship with a drug dealer. The song has a slightly menacing tone that complements lyrics about the false sense of friendliness one might experience in such a transaction-based situation. An exclusive bonus performance of "Yeah You Know" follows, with lyrics combining a long-distance relationship with the nomadic lifestyle of a touring musician. Wrapping up the session is "Tea-Soaked Letter," an effervescent song that brings back those head-rush feelings of new affection. Listen to the session in the player.